RAVENSWOOD, W. Va. — On Greenhills, the Red Devils were simply too hot for the likes of the White Falcons and Yellow Jackets. That’s because the host Ravenswood Red Devils defended their home course on Monday —easily winning a quadrangular golf match at Greenhills Country Club in Ravenswood. The Red Devils — by firing a team total of 163 — defeated West Virginia rivals Roane County (195), Williamstown (199) and Wahama (239) on a steamy and sweltering afternoon. The top four individual scores counted towards the team total, as the Red Devils dialed up four scores of 44 or lower. Only Eli Inman of Williamstown, with a 42, shot better than two of the Red Devils’ top scores. In fact, Ravenswood swept the top two spots — as Alex Easthom shot a smooth even-par 36 to capture match medalist honors. Ciah Kennedy, with a 40, claimed medalist runner-up —while Carson Fox with a 43 and Devin Raines with a 44 were the other two counting cards. Only Wahama — with five golfers — did not sport a full field of six. Ravenswood’s non-counting scores were Gavin Fox with a 51 and Phillip Goodwin with a 62. Roane County’s 195 featured a 47 by Ben Fox, a 48 by Grayson Watson, a 49 by Garrett Simon and a 51 by Casey Jones. Besides Inman’s 42, Xavier Caruthers with a 45, Chase Smith with a 52 and Brady Gaines with a 60 were Williamstown’s counting scores. The White Falcons finished with a 239 —including a 54 by Anthony Ortiz, a 59 by Jase Heckaman and a pair of 63s by Gage Smith and Dalton Kearns. Wahama’s only other score was a 66 by Khyer Bush. 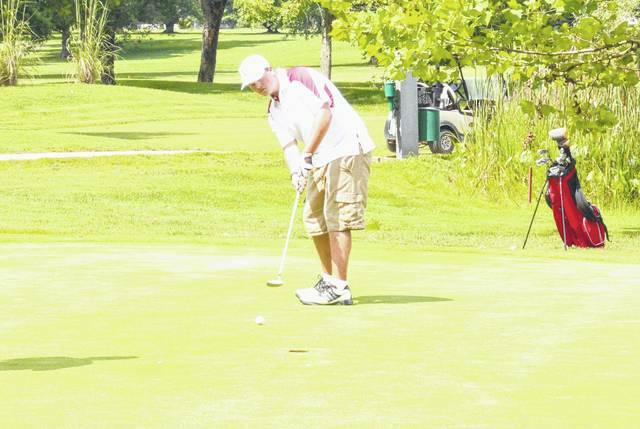 Wahama’s Gage Smith putts on the fifth hole during the White Falcons’ season-opening golf match on August 1 at Riverside Golf Course in Mason.